Friday, April 21, 2017, 1-9 p.m. at Parkade Baptist Church in Columbia, Mo. 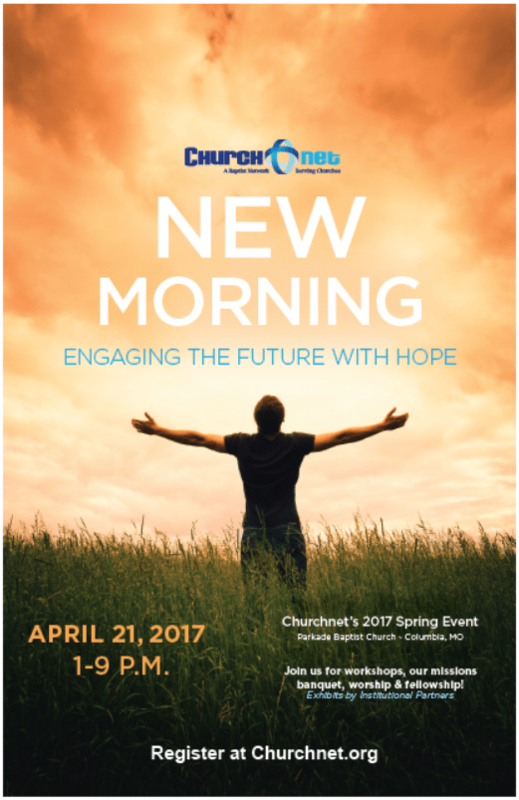 Churchnet’s 2017 Spring Gathering will feature the installation of our new Executive Director, Brian Ford, and recognition of outgoing Executive Director, Jim Hill, for his service and leadership since 2004. Churchnet President Forestal Lawton will give his first presidential remarks since his election as president at last year’s gathering. The Missions Banquet will feature stories and updates from Churchnet’s partnerships in Guatemala and Cuba. The banquet reports will be led by Gary Snowden (Churchnet Missional Collaboration Team Leader), Terrell Carter (pastor of Webster Groves Baptist Church), and Brian Kaylor (Churchnet Associate Director). This free meal will feature Lutz’s BBQ and an opportunity to give to support Churchnet’s missions partnerships. After you register, please share this page on Facebook!